RENO, Nev. - The founder of a Native American rights group that was rallying in Reno, Nevada, when a pickup truck plowed through protesters wants to know why police haven’t arrested the driver. One woman remained hospitalized Tuesday with non-life threatening injuries. Four others suffered minor injuries Monday night in what one witness described as a hate crime. Another said two men in the truck had been yelling obscenities at the protesters earlier in the day. A Facebook Live video of the protest shows a pickup truck revving its engine in front of the crowd in Reno’s downtown. Several protesters confronted the driver and the passenger before the truck drives through the crowd at about 6:40 p.m. Monday. The driver of the white Nissan pickup stopped several blocks away and called police “to provide his account of the events,” Reno Police Sgt. James Pitsnogel said in a statement early Tuesday. The driver and a passenger were interviewed and are cooperating, he said. No other details were released. 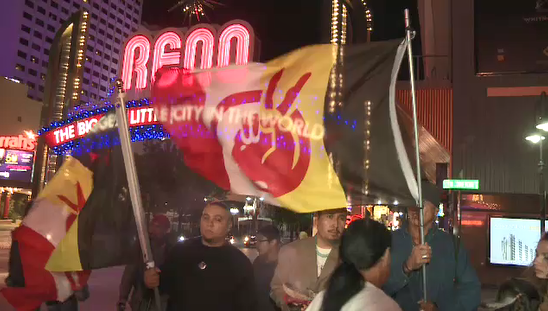 CBS Reno affiliate KTVN-TV reports that the 40 or so gathered protesters did not have a permit, and that protesters said they were there supporting the nationwide movement to abolish Columbus Day and to bring awareness to hate against indigenous people. Mike Graham, founder of the Oklahoma-based United Native American Association, said he planned to meet with Reno police Tuesday to find out more about the incident. “We are truly upset that he is not in custody. He left the scene of an accident,” he told The Associated Press. “It was a hate crime,” Quanah Brightman, executive director of San Francisco-based United Native Americans Inc., told the Reno Gazette-Journal. The protesters were speaking out against the Dakota Access Pipeline in North Dakota when the truck approached, she said. One of the witnesses who posted video on Facebook Live said the two men in the pickup had been “stalking the protest” at the original site where the activists had gathered two blocks away. “They drove by once as we were walking toward the arch, yelling obscenities,” said Taylor Wayman, 27, who said he was not an official member of the sponsoring groups but decided to attend the rally. “I heard the driver ask one of the protesters, ‘do you want me to kill your homies?’ and that really set everybody off,” Wayman told AP on Tuesday. “I think they felt threatened, the protesters felt threatened. It escalated from there and that’s when it happened,” he said. “It was disturbing. The young man was very, very calm as he pressed the accelerator. I’ve never seen anything like it and I won’t forget that,” Wayman said. Graham was in Reno for the protest but wasn’t present when the truck drove through.